And there are some thoughts now on the site for Knights of the Old Republic #45, as well as a page for the creepily-covered issue #48, featuring the origin of Demagol. The eighth KOTOR trade paperback has been announced for February; I'll have a page on the site for that here eventually. 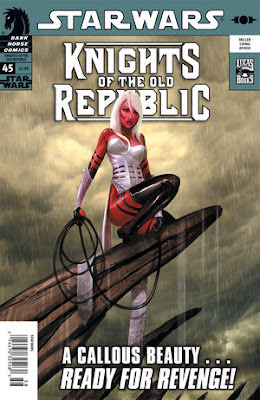 Knights of the Old Republic #45: A Date with Danger! Star Wars: Knights of the Old Republic #45 goes on sale today, and the first part of "Destroyer" answers a whole bunch of tasty questions. Why is Zayne Carrick imprisoned on a faraway planet and forced to fight for survival? What is the mysterious Crucible all about? What is the connection between deadly Chantique and Jarael — and what's Chantique's interest in Zayne? And what secret has Jarael yet to share with Zayne? Answers to all these question and more at your local comic-book retailing establishment! I'll have some notes on the site here later, but in the meantime, enjoy and leave your comments! Quite a few electrons have been sent hither and yon this past week on the asking of favors from writers. It seems to have started (as much as I can tell from within my bunker) with Josh Olsen's piece for the Village Voice on the reading of screenplays for near-strangers, and the response to it. Harlan Ellison then read a Seuss-ified version of the piece echoing the sentiments. Now, today, John Scalzi has written another piece from the writer's perspective. 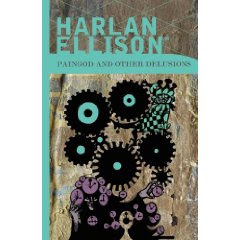 I haven't told this story before, but I have an interesting take on it — as almost exactly ten years ago, I sent Harlan Ellison a short story to read. I was still at Krause Publications then, writing up a storm for Comics Buyer's Guide. At one point, Harlan, a longtime friend of Maggie Thompson's and a regular reader of CBG, called me at the office to let me know that he'd enjoyed one of the longer-form pieces that I'd written. And that I should try to write fiction. I'd been scratching out fiction at night, submitted nowhere and seen by no one — the short story market being largely out of my sight. But this was diMaggio asking if I'd ever picked up a bat. (Or more accurately, select your superstar who's still playing.) I was energized by the advice, and so I kept at it. Some months later, knowing that Maggie would be seeing him, I asked Harlan if he could take a look at one of my short stories and share his thoughts. Coming at it from the perspective of someone now writing full-time for a living, I probably wouldn't have done that. I don't really know that I knew any better. In any event, I was very moved when he agreed. Time passed, and I had largely forgotten about it — when he called me at the office one day, story in hand. Over the course of a couple of hours and several phone calls, he went through several pages of it, relating thoughts and pointers that I noted as quickly as I could. He got a lot farther into it than I would have; it wasn't a completely God-awful story, but I could think of about nine things I'd do differently with it now (if I ever thought of that story at all, which I try not to). My stomach was in a good tangle by the time we were done, but I had a lot of notes for the future, including at least one I try to mind daily. He went, in all respects, farther than he had to. I was thankful then, and now. Probably more, now, as I've clued into just how special a moment that was. It was one of a number of nice things he did for a kid he barely knew. But I don't write this as advice to send your stories to Harlan, or to any other author. Nor am I writing to say, "well, I did it, but you shouldn't." Now with the Internet, aspiring writers have more access to published writers than ever before — and every writer is different. Some have time and an open door. Others don't. It's my sense that people in all fields (and not just creative ones) are constantly measuring just how much time they have for public outreach — and that they usually give exactly what they have time to give, and still be effective at what they're paid to do. A lot of us come at it in different ways. When I started writing comics and prose fiction professionally, I committed to doing behind-the-scenes pages on every publication I was involved with. A lot of weeks, after my paying work is done, I have time to do exactly that, and only that — but I want to do it, and I try to do it. I really don't think that many people in creative walks of life think they're guardians at the gates, keeping people out of some walled garden. I'm not sure why you'd see panels with Q&A sessions or blogs with comment buttons, otherwise. The idea isn't to never, ever ask for help — it's to be respectful when you ask and to be understanding if they decline. And, if they can help, to be a grown-up over what they say, and to be thankful when they're done. Basically, to be decent. That becomes a two-way street. You may be trying to finish the next great work of Western literature — but they may be trying to do the exact same thing. Being unpleasant strikes me as the one way to make sure neither gets done. Wisconsin and Northern Illinois readers, I'll be appearing Saturday at Edge Comic-con, a new one-day show in Edgerton, Wis., along with guests including Jeff Balke, Mike Hoffman, Mike Hoffman, and Art Baltazar. Show opens at 10; a panel on my work is at 4. Click the link for directions. Not only that, there's a chili championship nearby at the same time. Comics and chili — you can't miss. See you there! 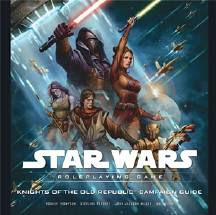 I was asked if I had copies of the Star Wars: Knights of the Old Republic Campaign Guide I co-wrote last year for sale. I don't, but I was surprised to learn how dear they've gotten. Amazon has only used copies ranging today from $93 to... $475? !